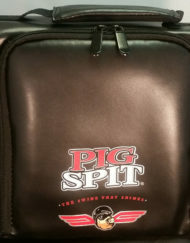 Pig Spit Glass and Plexi Cleaner is the fast and easy way to clean all glass, plexi and plastic surfaces. Available in 13 oz. cans. Restores and protects Plexiglass from spiderweb scratches or stress cracks. Simply spray and wipe off. Safe enough to be used on all glass and plastic surfaces. Contains no ammonia, making it an excellent cleaning product for most surfaces.